In his excellent 2008 book “Outliers: The Story of Success”, Malcolm Gladwell examined why the year 1955 seemed to spawn so many of the founders of the personal computer industry, including Steve Jobs, Bill Gates and others. In a nutshell, it is because being born in that year increased the odds that a person would be at a certain point in their lives in the month of January 1975. That was the month in which a critical event occurred that most people believe was the trigger for the personal computer revolution: The publication in Popular Electronics magazine of the article and electrical schematic diagram of a computer based on the new 8-bit Intel 8080 microprocessor. Because of their specific age at the time, and their exposure to other important resources, that event caused brain-bursting ideas in Jobs, Gates and others so strong that they may have led to spontaneous changes in their DNA (or was that the LSD that some of them were taking?). According to Wikipedia, “Paul Allen showed this [magazine] to his friend Bill Gates and they started Microsoft to write software for this computer.” At the about the same moment, Steve Wozniak showed this magazine to his friend Steve Jobs and they started Apple Computer Company to build a cheaper (and later a better) computer based on the lower cost 8-bit MOS Technology 6502 microprocessor in Jobs’ garage. You probably know what eventually became of those guys. SO WHAT DOES ALL THAT HAVE TO DO WITH ME? I was also born in 1955, but I grew up in rural Illinois, far from the kind of resources that Steve Jobs and Bill Gates made use of to get their starts. I did not see the January 1975 issue of Popular Electronics. My high school did not have access to a cutting edge computer terminal. I did not live up the street from Bill Hewlett (co-founder of Hewlett Packard). I did not have friends named Paul Allen or Steve Wozniak. A few years later my wife and I visited my parents for a few days after having graduated from college with a BS in Geography. During that visit we were just crossing the front yard, completing a walk around the neighborhood, when my friend Scott pulled up and leaped out of his car to chat. I remember that he was very animated when he showed me a couple of magazines he had found that were dedicated to the budding new hobby of building home computers. I was completely unaware that something like that had existed, but Scott knew me well enough to know that I would be interested so he gave me the magazines. What Scott knew was that I had taken a Fortran programming class when we were roommates and from that experience I had fallen in love with computers and programming. At that time I told him that I wished I could have my own computer, but, of course, computers were things that only big corporations and universities could afford. So when he stumbled across these magazines and saw that you could now build a computer at home for less than $500, he know I would be interested, and I was. Very interested. Keep in mind, there wasn’t an internet and the popular press couldn’t care less about computers back then so the only way you could get information about what was going on in those early days was to buy computer magazines at computer stores. My wife and I moved to Madison, Wisconsin where I had been accepted into the Meteorology department in the Master’s program at UW (I was interested in writing computer software that would simulate the atmosphere to predict the weather). But because we were from out-of-state, I delayed starting and we both worked for another year so we could afford the tuition. During that time I kept buying and devouring home computer magazines and as a result I had the same kind of DNA-changing experience that the pioneers had, and with me at least, drugs were not involved. In 1978 I took out a loan and bought a computer kit that was a collection of circuit boards from multiple manufacturers (The CPU card, S-100 bus, power supply, card cage/rack and diskette drive were the Z-2D from Cromemco) based on the 8-bit Zilog Z80 microprocessor (an enhanced clone of the 8080 instruction set) from the local computer store for $4,500. The loan officer was totally confused, but agreed, as long as my Dad co-signed. I had to solder all the components, plug it together and when it did not work, I had the store look over my work to find one of the circuit boards had manufacturing defects on it–a couple of traces that were too thin. Once repaired, the computer worked! My Dad was a science teacher. He too, got hooked on computers in 1979 after visiting us in Madison. By that time there was a Byte Shop in Madison which sold the new Apple II computer. Dad bought one (and I still own his original Apple II as well as the portable Apple IIc that he later bought). The original S-100 bus interface board I designed and built is in the middle. 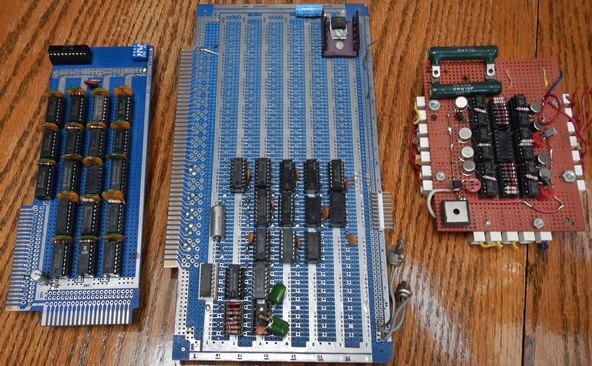 The board on the left is the one I later designed and built for my Dad’s Apple II. The board on the right is the power transistor driver board that converted the TTL signals from either of the two interface boards to high current signals capable of driving the solenoids in the Selectric undercarriage. Click image to enlarge. During that year I taught myself enough about digital electronics and machine language programming that I designed, built and made work an interface card for my computer that drove electromechanical solenoids on an undercarriage that I also built for an IBM Selectric typewriter. The undercarriage contained levers that the solenoids pulled to manipulate the Selectric’s mechanical 7-bit code. I then wrote a very sophisticated (for its time, on a home computer) cursor-oriented text editor for my computer (in assembly language) so I could write documents and save them on my single-sided, hard-sectored, 5 ¼ inch floppy disk. It worked great! I had created a 10-characters per second, letter-quality printer for next to no cost (I already had the typewriter) in the days of dot matrix and expensive daisy wheel printers. I did all this before August 1979, all while holding down a full time job repairing typewriters (the IBM Selectric was my specialty and those skills were in considerable demand at the time). By the time August came around I was just about to start working on my Master’s degree when my Dad helped me recognize that my real passion was no longer Meteorology, it was computers and especially software. To my surprise, I was accepted into the Electrical and Computer Engineering (ECE) Department at UW-Madison within a week and I began classes a few weeks after that. I was in the ECE department, but my real interest was to write driver-level software. I figured I would be happier in ECE than in the Computer Science department where I thought they only taught you how to write financial and business software (yuck). 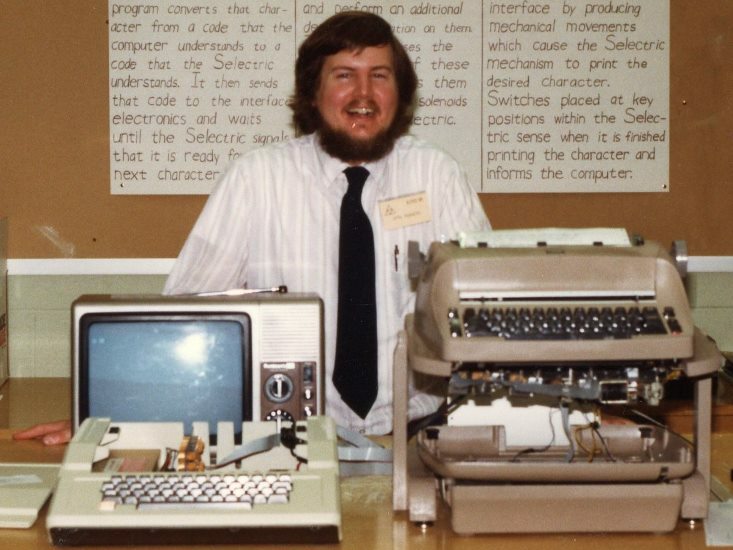 I displayed my original Selectric printer and Apple II interface card at the 1981 UW-Madison Engineering Expo. Click image to enlarge. While attending UW-Madison I bought a Selectric II typewriter and found an old solenoid undercarriage from an old Selectric-based mag-tape machine (these were predecessors to the dedicated mini-computer-based “word processors” used back then). This time I designed and built an interface card for my Dad’s Apple II computer and wrote a driver in machine language on the Apple so that he could use the Selectric printer directly from his Apple Writer program (just hit OpenApple “P” to print). I bought a 300-baud modem kit with an acoustical coupler and wrote a modem driver for my computer (assembly language again) so that from my text editor I could transmit the current document out the modem and interact with remote computers as a terminal (remember…no internet back then). I used “social engineering” to surreptitiously get (steal) the phone number to the university’s terminal modem bank, which, at the time, was strictly reserved for Computer Science professors and masters and PhD students only. I did all of my programming homework assignments from home, editing on my own computer with my homemade text editor and then downloading and executing the program code on the university’s mainframe! I never got caught because no one really knew anything about computer security back then. I graduated in 1982, a year after IBM introduced their first personal computer. I have never bought an Apple product because I was always interested in writing software that took full control of the computer. After the Apple II, Steve Jobs made it his mission to ensure that was increasingly difficult to do on Apple computers, so I worked with IBM compatible systems with Microsoft operating systems (MS-DOS and then Windows NT and later) my entire software career, applying them–driven by my software–to automate warehouse, supply chain and material handling processes. So that’s the part of my history that somewhat parallels those of Steve Jobs and Bill Gates. Not quite as exciting as theirs—I did not start a company until last year—but I have had a lot of fun and I have worked with a large number of very smart and very talented people along the way. And I’m not done yet! The idea to write this essay came to me as my wife and I listened to the unabridged audio book “Steve Jobs” by Walter Isaacson as we drove to South Dakota and back earlier this month while on vacation (25 hours!). We both liked it a lot. Steve Jobs was an amazing character. I also recommend “Accidental Empires: How the Boys of Silicon Valley Make Their Millions, Battle Foreign Competition, and Still Can’t Get a Date” by Robert X. Cringely, although it’s a little old. I read it back in the 1990s, in the early days of the internet.